HOUSTON – Three UTHealth School of Public Health students have received the 2017 Excellence in Public Health Award from the United States Public Health Service. The award recognizes medical students who are involved in public health issues in their communities and who increase awareness of the U.S. Public Health Service’s mission to protect, promote and advance the health and safety of the nation. The students — Romero N. Santiago, Puja B. Gandhi and Arianna Fresquez — are pursuing dual degrees in medicine and public health (M.D./M.P.H). School of Public Health M.D./M.P.H. students earn their M.D. 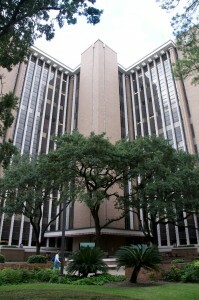 degrees at partner medical schools throughout Texas, and their M.P.H. degrees from UTHealth School of Public Health. Santiago, a fourth-year medical student at UT Southwestern Medical School in Dallas, received the award for the breadth and depth of his public health work. He has promoted bike safety and healthy diets; improved dental care in his community; governed the Texas Medical Association (TMA) student body as its chair; led the American Medical Association student body discussion on subject areas relating to population health, including the harms of e-cigarettes, and participated in public health surveillance efforts. “Romero has demonstrated a strong commitment to preventive medicine and public health through leadership at the local, state, regional, and national levels in a wide variety of projects and organizations focused on improving the health of his community and our nation overall. He truly stands out among his peers as a public health leader,” says Lieutenant Commander David Jackson, M.D., a USPHS medical officer and awards committee member. Santiago customized his M.P.H. to focus on epidemiology and infectious disease. After he graduates from UT Southwestern Medical School in June, he will start his three-year residency in family medicine at the University of California Davis in Sacramento. Santiago says he is humbled by this USPHS honor, and eagerly looks forward to using his public health skills to help families and communities. Gandhi is a third-year medical student at McGovern Medical School. Gandhi’s public health experience in the Houston area has been particularly noteworthy, says Jackson. “Her demonstrated commitment to public health improvement is impressive,” Jackson says. He cites her participation in the South Texas Environmental and Educational Research Program, during which Gandhi learned about pertinent U.S.-Mexico border issues and how to provide focused health services tailored to the community. She also used cultural competency to improve health care quality during her internship with the Houston Department of Health and Human Services. Gandhi graduates from medical school in May 2018. She’s earning her M.P.H. in epidemiology and healthcare management, and hopes to use her M.D./M.P.H. to address global health disparities. “I want to improve access to quality health care and education, especially in underserved areas, through globalized medicine focused on prevention, and working with public and global health organizations to address the relevant health issues faced by our community,” Gandhi says. Fresquez, a fourth-year medical student at The University of Texas Health Science Center at San Antonio School of Medicine, has focused on the health of adolescent girls in South Texas. Jackson says the awards committee was struck by her work with the Texas Medical Association to improve sexual education programs in Texas schools; her discussions with political leaders across Texas; and her work with teens in the San Antonio area. She’s currently an intern for Healthy Futures of Texas, an organization that provides and promotes strategies to help young people make healthy decisions and avoid unplanned pregnancies. “Beyond these specific efforts, she has demonstrated on-campus service with her organizational leadership and peer mentoring,” Jackson says. Fresquez customized her M.P.H. to focus on adolescent sexual health and behavior. After graduating from medical school in May, she will start her obstetrics and gynecology residency at The University of Oklahoma-Tulsa. She plans to use her dual degree to focus on women’s health. “I now have a different perspective of medicine that focuses on entire communities and prevention rather than on a single person and solving problems after the fact,” Fresquez says. USPHS medical officers present the honor to awards recipients in person. Fresquez received her award March 23 in a ceremony at UT School of Medicine in San Antonio. Santiago will receive his award June 2 at UT Southwestern. Gandhi will be presented with her award at McGovern Medical School on July 26.